When it comes to deep acne scarring and deep wrinkles there are a lot of questions about injectable treatments. 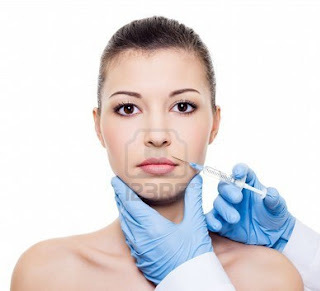 There is the familiar Botox treatment which I will detail today and other injectable "fillers". I am including some important new information on these products as well so you will want to read carefully. Botox or (botulinum toxin type A) and Myobloc or (botulinum toxin type B) are purified forms of bacteria. In large amounts, they block the nerve impulses to muscles, causing a form of paralysis called botulism. By using extremely small doses of Botox/Myobloc, injected directly into a specific muscle, only the action of that muscle will be paralyzed. Therefore, the problem that muscle causes, like a frown line, or in other cases, a twitch or spasm, will be stopped. The actual treatment takes only a few minutes and the Botox takes effect in three to four days. Gradually, over three to four months, the Botox effect will fade, and the muscle action will return. When the frown line starts to reappear, a repeat treatment will be necessary to maintain the desired result. You will need to remain upright for a few hours following the procedure. Approximately 1% of patients will develop a slight lowering or drooping of one eyelid (also known as ptosis). This is supposedly temporary. Most of the side effects of Botox are related to the local injection of the solution. There will be some discomfort from the needle entering the skin and a small chance of a bruise at the site of the injection. HOWEVER, new studies are finding a disturbing occurrence in the bodies of those using this product. It now appears the Botox enzymes travel to other parts of the body as it breaks down. Botox was found in the feet and nails of subjects in the studies, even in those who hadn't received the treatment for a number of years. This means the product stays with you for long time. Something to note as it is not known what effects this is or will be having on the body over time. Other reported side effects include headache and upper respiratory infection. There are no reports of damage to the eye with injections to the eyelid. There have been no permanent side effects from the use of Botox as of yet. What's The Price For This Fountain Of Youth? Botox is not cheap. The average cost of just one Botox injection in the United States is about $350.00. This also depends on what area of your face is getting the injections. The area near the eyes is more expensive, costing between $400.00 and $900.00 per injection. For large surface areas such as the forehead, injections can be between $600.00 and $1300.00 a pop. If you are interested in learning more about Botox/Myobloc injections, please contact your general practitioner or local dermatologist. They should be able to refer you in the right direction. I personally don't use Botox or ever plan to as I prefer to stick with naturally-based methods for the removal/prevention of lines and wrinkles and acne scarring. I hope the information above will help in your decision making process in choosing Botox/Myobloc injections. I get that injecting "toxins" for vanity isn't the best thing to do but check your prices. Botox is NOT that much per injection. It is $8-$14 a unit, depending on where you live. An L.A. doctor will charge more than a mid-west doctor. There is 100 units in a bottle. I don't think they recommend doing that much in one appointment unless you are doing hyperhydrosis (excessive sweating in your armpit). I would hope that people would do a lot of research before doing anything & not just going to a day spa for a medical procedure. I had botox 2 weeks & 4 days ago 36 units injected around my eyes & under my eyes. I now have terrible bags from the weaking of my lower eyelids which now show my whites under my eyes and dry my eyes out. My tear troughs are deeper & longer and make me look older & tired. Did anyone report thier side effects with Allergan. When I did they said that everyone has recovered from thier side effects like this. You should call them & let them know it has not. I have talked to them over & over and am scared half to death. I feel like this is ruining my life & I just wan to look normal again. I don't know what to do. I want my face back!!!! I had botox a year ago and got dropping eye lid and it seems to be permanent as I still have some damage after a year!! DO NOT DO BOTOX, if something goes wrong the damage can be much worsse than a couple of wrinkles! !